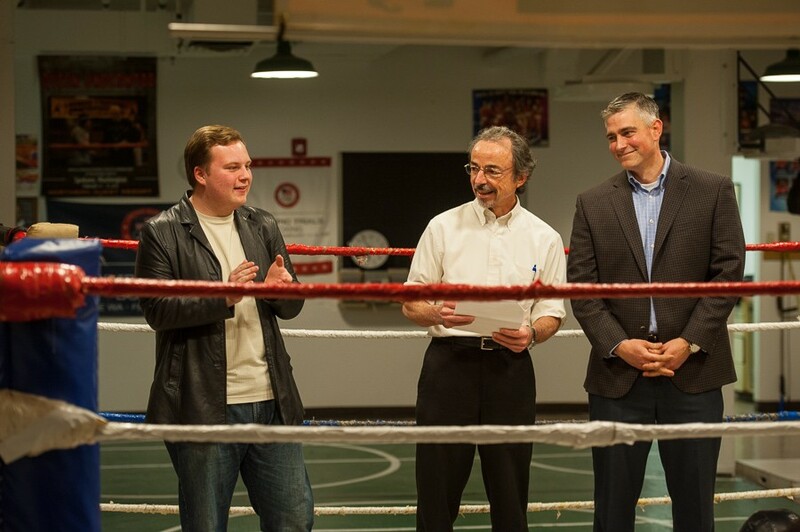 Then-Rogers High School student James Pearson faces off against Washington state Sen. Michael Baumgartner in 2016. Former Spokesman-Review editorial page editor Bert Caldwell is stuck in the middle. Generally, unless you're a lawyer, it's a bad idea to start arguing with a judge. It's the fourth such fundraiser for the Rogers High School debate team, to be held on Tuesday, Jan. 23, at 5:30 pm at the Howard Street Gym. Fundraisers, whether they be entertainment book deals or door-to-door wrapping paper sales, tend to be among the most miserable school activities. But a few years ago Rogers debate coach Cara Heath says she was discussing the need to pull off a fundraiser with public affairs consultant Jim Hedemark when they came up with an "intriguing idea": Pit the student debaters against local politicians or celebrities. Find local sponsors and ask for donations to support the team at the event. And so Rhetoric in the Ring was born. In past years, the celebrity debaters have included City Council President Ben Stuckart and City Councilmember Mike Fagan, Washington state Sens. Andy Billig and Michael Baumgartner and local school board members. This year, they're taking on the local district court judges. "It’s worked out tremendously in terms of fundraising," Heath says. "It’s one of the first questions they ask me in September. When’s 'Rhetoric' going to be?" For now, the topics are held a close secret — hidden from both high school debaters and their judge opponents. "Basically, what we do is I come up with two topics, we give them to our ringmasters," Heath says. "The ringmasters choose which of the two topics we give to our debaters." In years past, the topics have been a more on the lighter end. Less, say, discussions about racial inequity in the criminal justice systems and more, like, which is better, Harry Potter or Twilight. One of last year's topics pitted traditional books against ebooks. Last year, Lynch argued that we should incentivize deep-sea exploration more than space exploration, while Spokane School Board member Robert Douthitt argued the opposite. "His main contention was that space, in itself, was a new frontier," Lynch says. "My biggest contention that if we can’t explore the bottom of the ocean, how do we expect to explore space?" High school debate competitions come in a variety of different formats. For example, there's Lincoln-Douglas, which trends philosophical. You're likely to hear the phrase "Kant's categorical imperative" quite a bit. Then there's policy or "cross-x" debate, which pits teams of debaters against each other over very specific policy implications. Generally, it involves speaking at an incomprehensible speed about how your opponent's proposal would lead to genocide or nuclear war. But the Rogers debate team specializes in Student Congress, a mock legislature that pits 15 to 20 students together to compete over who can be the best pretend senator or representative. Students propose bills, give speeches, and take votes on issues like, "Should it be mandatory for school security officers to carry firearms?" "They [get] points for the speeches themselves," Heath says. "How well do they contribute to the chamber? Do they ask good questions? Do they follow Roberts’ rules of order?" Students also compete in individual speech events. Lynch specializes in Impromptu, which features debaters making a six-minute speech on a topic they've never seen before. At their last debate tournament, for example, he was asked to opine on "Pastafarianism." "I did a pretty good job, despite not knowing what Pastafarianism was," Lynch says. "I actually looked it up [later], and realized I was far from the truth." He still got pretty good scores from the judges though. Traditionally, high school debate is an activity that often privileges wealthier schools over low-income schools. At Rogers, the school with the highest percentage of low-income students in the Greater Spokane League, pulling off the activity can be challenging. "I think I have the smallest team in the GSL," Heath says. When the Inlander examined high school debate back in 2009, it found income presented a sharp dividing line between schools with more high-income students — which, generally, consistently had a debate team — and lower-income schools, which typically didn't. Back then, Rogers had a team, but with their debate team's budget a mere $750 compared to Central Valley's $4,000, they had to pick and choose which tournaments they could afford to attend. But pull off a great fundraiser that brings in a lot of money? And suddenly you can go to any tournament your heart desires. Former debaters and current coaches lament the state of high school debate in the Spokane area. Feel free to argue.